Our Wildfire jewelry theme captures vibrant shades of red mingling with blue and opal to make a truly unique fashion statement. Every piece features multiple gemstones intricately placed side-by-side using the multicolor inlay technique. Only the most talented artists can effectively implement this technique, which takes incredible attention to detail. The Wildfire jewelry theme is known for its brilliant use of bright coloration. The colors used include blue, red and opal. We select the stones used based on quality and availability. Only the highest grade of stones is used in this collection. All of the products in this collection are handcrafted using the finest materials available, including genuine sterling silver. The Wildfire theme captures the rugged southwestern landscape that has challenged and inspired tribes for centuries. The artists who craft our Wildfire jewelry theme embrace the traditional methods and draw inspiration from the Southwestern tribes who have been making beautiful jewelry for centuries. A wildfire is one of the most powerful forces of nature, bringing both destruction and rebirth. It is one of the most extreme examples of the life cycle that is so important to Native American cultures and civilizations throughout the world. Fiery red is the most important color in the inspiration of this theme. At SilverTribe, your Wildfire selection could include Mediterranean coral, red oyster shell, or carnelian. Another important stone used in this collection is fiery opal. We use blue and white varieties, depending on availability and style. 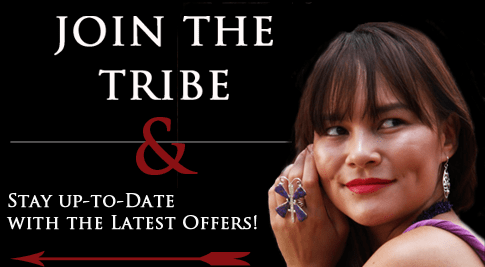 Our WhiteRock Collection offers the finest selection of exclusive handcrafted jewelry inspired by the spirit and ingenuity of American Indian tribes. You'll find the best prices on the most sought after styles of jewelry and art on the market today. You'll always find the best prices on a growing selection of products made to the highest standards of quality and beauty. We always offer free shipping in the United States and guarantee customer satisfaction. Sign up for our email list today to become a preferred member. You'll have access to exclusive deals and promotions.